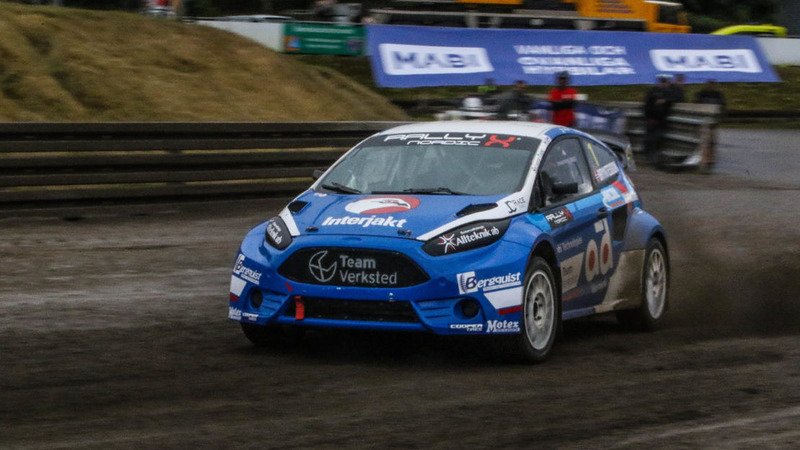 Thomas Bryntesson has topped the timesheets in first free practice for round four of the 2018 RallyX Nordic season at a wet and muddy Nysum in Denmark. With steady rain making conditions tricky once action got underway this afternoon, drivers practicing in the latter stages of the session made best of the conditions with JC Raceteknik’s Bryntesson and Ola Froshaug leading the way and split by just two tenths of a second. In third position, home hope Ulrik Linnemann was a strong third quickest in his VW Polo Supercar, ahead of Oliver Eriksson, Peter Hedstrom and series returnee Philip Gehrman. Championship leader Oliver Solberg was one of the first on the slippery track and thus two seconds adrift of Bryntesson in seventh position. However, with rain forecast for Sunday, the additional wet weather mileage in practice could yet prove crucial. In the Supercar Lites class Vasiliy Gryazin was quickest from William Nilsson, while European champion Sivert Svardal headed up the new Super Touring RXN category.